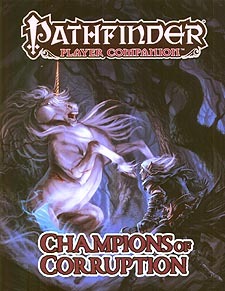 Claim what's rightfully yours with Pathfinder Player Companion: Champions of Corruption! Summon monsters from the blood of your enemies with twisted Sarkorian magic, lord over your minions to further the causes of your dark masters, and use any means necessary to achieve your despicable goals. With Champions of Corruption, everything is fair game as long as you prosper and your enemies suffer. Detailed explorations of the lawful evil, neutral evil and chaotic evil alignments, including example personas for your vile character. New Archetypes: the sanguinary blood summoner, the godless dread vanguard and the bloodthirsty raging cannibal. Savage new traits for characters who hail from dark lands, and rules for wicked ones who seek to lord over Golarion's most debased nations and organisations. Brutal new spells, magic items, and other sinister options to sate your bloodlust and strike fear into the hearts of heroes who would oppose you.